Captain GW was raised on the waters of South Florida. He began fishing the backcountry waters of Everglades National Park in 1985 with his father. Chasing tailing redfish on the flats and working popping corks for trout are some of the memories he has of fishing with his father. At the ripe young age of 20, he set out to fulfill his dream; becoming a professional fishing guide in the Florida Keys. So he loaded up his truck and moved to Islamorada, Florida. Since then he has become an accomplished fishing guide. He has guided his anglers to many accolades such as high point angler, grand champion, high point fly in several inshore tournaments and placed in many others. He has developed many new fly patterns and improved existing flies and knots. He has been featured on ESPN2's Subaru American Outback 2 years in a row. He has been seen in T.V. Commercials, national fishing magazines, catalogs and brochures. Fishing the calm, clear inshore waters of the Florida Keys and Florida Bay, you seldom experience rough or choppy water. The average depth of Florida Bay is 18" (yes that's INCHES). So seasickness is not anything to worry about. Capt. GW's flats boat is a 2007 Maverick Mirage 18 HPX with a Yamaha 115HP four stroke. It has a wide beam and can hold 3 anglers. People who know boats know it is the quietest boat on the market. This allows anglers to get closer than ever to the fish. Fishing in the Keys is available year round. Different times of the year provide better conditions for certain species. 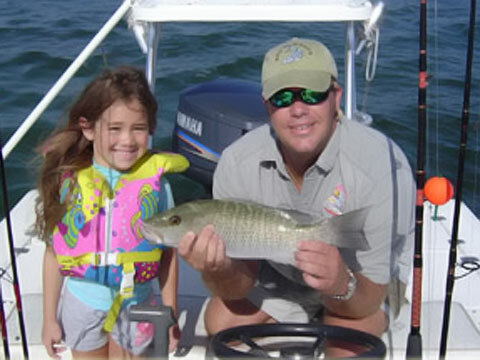 Whether you are after bonefish, tarpon, permit, redfish, sharks or trout, Capt. GW will tailor your trip to provide you with the best possible fishing situations. Check with the Capt. when planning your trip based on what specie you are after. Spring and summer provide the best opportunity for large tarpon. An evening tarpon trip is a great way to catch one. The trip is from 4:30pm to about 9:00pm. Youâ€™ll be able to enjoy the Keys famous sunsets while fishing! Whether you are a veteran fly angler or on your first fishing trip, Capt. GW will be able to accommodate you. Capt. GW recommends bringing a camera, polarized sunglasses, sunscreen, and a wide brimmed hat and if you are fishing in the winter months a light jacket could come in handy. Capt. GW has a very low stress approach to guiding. He feels itâ€™s your vacation and it should be a relaxing one. Capt. GW is always willing to help with your casting skill. Ask him about picking you up at your hotel by boat for your fishing trip. If you have a party of more than 3, Capt. GW can hand select additional guides to accommodate your party.